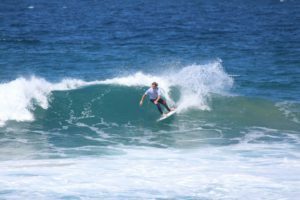 The Lizzard Hurricane Surf contest got off to a perfect start at Bronze Beach uMhlanga Rocks on Sunday when close on 70 surfers took part in 28 heats throughout the day, and families with picnic baskets enjoying time on the grass lawns at the beautiful Bronze Beach. With sizeable 4-6 ft wave faces and a contestable 2-3 foot bowl wave, a high scoring 7.5 saw Open Men Division Justin Sykes beat his rivals Kyle Lane, Matt Kruger and Nathan Wallace respectively and was also ‘Surfer of the Contest’. In the masters division it was series leader Carl Roux who took top honors again with a heat total of 9.5 with Rein Van de Wall close on his heels with a total of 9 points. 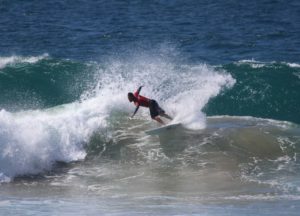 Local surfer Jaime Irvine won the low U18 boys final, with Westbrook Surfer Gabi Lailvaux securing herself another win in the U18 girls division. Gaby Herbst was the decisive winner in the U12 girls final while a close battle in the U14 division saw Jordon Boshoff take the win ahead of Julian Carbonal. In the U12 boys division run-away winner Thor Knutsen showed why he is the son of 3 x world Champion surfer Chris Knutsen by taking the win with a 2.5 point excess in the totals. With ten little boys entered into the novice division, it was Damien Frew who scored a total of 11.5 (with the help of his Dad Mike doing the caddying). It was an exceptionally good day with perfect weather and plenty of good (and sometimes tricky) waves being tricky but plentiful. Full results listed below.